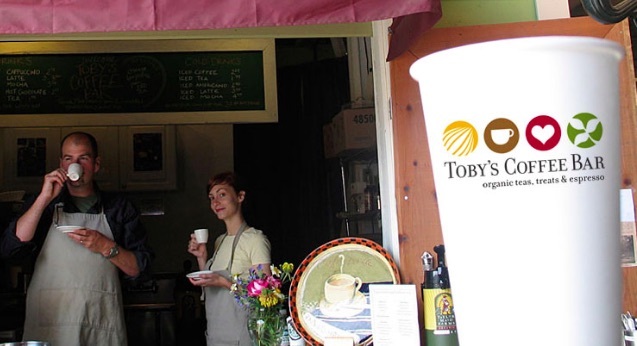 Located in the heart of downtown Point Reyes Station, Toby’s is a family owned and operated general store and working feed barn that has been serving the community since 1942. It offers a unique range of goods from fresh, local organic produce to gifts, garden supplies, pet food, hay and grain. Toby’s Feed Barn is host to numerous events including author talks, concerts, weddings and fundraisers. It is also home to an art gallery, a coffee bar, a yoga studio, a community garden and a world famous farmer’s market, making Toby’s a vibrant and vital part of the Point Reyes community. Looking for the perfect t-shirt, gourmet chocolate or exactly the right gift for a hard to please relative? You’ll find it at Toby’s. Need food for your cat, dog, goat or your parrot? Toby’s has got it. Or maybe you’re looking for some newly hatched chicks, organic vegetable starts or a Christmas tree? Then Toby’s is the place for you. Toby's Coffee Bar located within Toby's Feed Barn, next to the post office, serves organic treats and coffees. Nestled inside of Toby’s Feed Barn, Point Reyes Yoga offers a warm & welcoming environment to learn and practice the ancient art of yoga. Operated since 2001, Point Reyes Yoga features beautiful hardwood floors, solar power and a modern Zen garden featuring a Ten Thousand Buddhas Mural. Celebrate local, celebrate organic! Piles of sweet, red strawberries; mounds of golden summer squash; bunches of baby spinach and arugula picked at dawn; homemade jams and fermented foods; home grown sheep wool; and grilled cheese sandwiches to die for! These are just a few of the many delights on offer at the Point Reyes Farmer’s Market. Toby’s is proud to host the only all local and all organic market in the Bay Area, which gained international recognition when it was visited by HRH Prince Charles and Camilla, Duchess of Cornwall in November of 2005. With live music, cooking demonstrations, book signings by renowned chefs and more, the market is truly a feast for the senses. Come and be part of the community, meet your local farmers and enjoy the finest organic food farmers can grow. Supported by the MALT (Marin Agricultural Land Trust), Marin Organic, the Palace Market, Point Reyes Books, and Toby’s Feed Barn. Hours: Every Saturday in summer, at Toby’s Feed Barn – rain or shine.